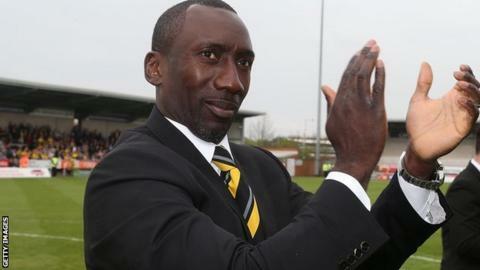 Burton Albion manager Jimmy Floyd Hasselbaink has said he would make a decision about becoming Leeds boss "with my brain and not my heart". Hasselbaink, who spent two years at Leeds between 1997 and 1999, has been linked with a return to Elland Road. Current head coach Neil Redfearn is out of contract in the summer. "Leeds is a very beautiful club. I'll make decisions for myself with my brain and not with my heart," Hasselbaink, 43, told BBC Radio Derby. "It's difficult for me to talk about because they have a good manager at the moment who has done really well and I have a job here that I really like. "It's not nice to talk about those kind of things." Former Leeds academy boss Redfearn, 49, became the Championship club's third head coach of the season when he took charge in November. He oversaw an upturn in the team's form but said he would have to consider his future at the club after assistant Steve Thompson was suspended earlier this month without explanation. Hasselbaink guided the Brewers to promotion from League Two after taking over from Gary Rowett in November. The former Netherlands international said he was not looking to move elsewhere, adding: "I am committed to Burton and I will do everything in my power to make the club successful for as long as I am here. "You can't do anything about rumours."